1860 ~ 1881: born in Nagoya in the district of Deki-Chô in a samurai family. He becomes bonze in Kyôto at the temple Daitokuji but leaves soon the monastic world to join a children-actors troupe. He makes his first stage apperance in 1874 in Ôgaki, playing under the name of Ichikawa Sennosuke. A few years later he takes the name of Nakamura Sennosuke II. He moves to Tôkyô in 1877 and plays mainly at the Harukiza. June 1881: Sennosuke gets married with Itô Haruko, whose aunt is the spouse of the star Suketakaya Takasuke IV. Sennosuke is adopted a few months later by this actor. September 1882: Nakamura Sennosuke II takes the name of Sawamura Tosshi VII at the Harukiza, playing the role of Oda Harunaga in the drama "Oke Hazama Narumi Gundan". Tosshi is one of the haimyô used by the Sawamura Sôjûrô line of actors and Sawamura Tosshi VII is the first actor to use it as a stage name. November 1883: premiere at the Ichimuraza of Kawatake Mokuami's drama "Zôho Tenjiku Tokubê", a revision of Tsuruya Nanboku IV's "Tenjiku Tokubê Ikoku Banashi"; Tosshi plays the roles of Sasaki Katsuranosuke and Sasano Saizô [casting]. January 1885: Tosshi plays at the Tsutaza (Yokohama) the role of Wada no Hyôe Hidemori in the drama "Ômi Genji Senjin Yakata"; the role of Sasaki Moritsuna is played by Suketakaya Takasuke IV. November 1887: Tosshi takes part in the opening ceremony of the Azumaza [more details]. January 1888: Tosshi plays at the Azumaza the role of Wada no Hyôe Hidemori in the drama "Ômi Genji Senjin Yakata"; the role of Sasaki Moritsuna is played by Ichikawa Kuzô III. March 1889: Tosshi plays for the first time the role of Takechi Mitsuhide in the drama "Ehon Taikôki", which is staged at the Azumaza. May 1892: Tosshi plays for the first time the roles of Sodehagi and Abe no Sadatô in the drama "Ôshû Adachi-ga-Hara", which is staged at the Sawamuraza (Tôkyô); His stage partners are Sawamura Yodogorô (Munetô), Sawamura Sônosuke I (Okimi) and Ichikawa Danzaburô IX (Yoshiie). November 1896: Tosshi takes part in the opening ceremony of the Miyatoza [more details]. December 1898: Tosshi plays at the Miyatoza the role of Igami no Gonta in the "Sushiya" scene of the classic "Yoshitsune Senbon Zakura". February 1900: Tosshi plays for the first time the roles of the villain Motoemon and Kôemon in the drama "Tengajaya-mura", which is staged at the Engiza (Tôkyô); His stage partners are Nakamura Shikaku (Iori), Seki Hanasuke II (Genjirô) and Ichikawa Danzô VII (Tôma Saburôemon). January 1902: Tosshi plays at the Harukiza the role of the shirabyôshi in the dance "Kyôganoko Musume Dôjôji". March 1903: Tosshi plays at the Misonoza (Nagoya) the role of Shigetada in the play "Dan no Ura Kabuto Gunki". His stage partners in the roles of Akoya and Iwanaga are Sawamura Sônosuke I and Seki Hanasuke II. June 1903: Tosshi plays at the Ichimuraza the role of Iwafuji in the drama "Kagamiyama Kokyô no Nishikie"; the roles of Onoe and Ohatsu are performed by Jitsukawa Enzaburô IV and Nakamura Fukusuke III. October 1904: Tosshi plays at the Miyatoza the role of Matahei in the play "Domo Mata". The role of Otoku, Matahei's wife, is played by Ichikawa Kigan IV. October 1905: Tosshi plays at the Engiza the roles of Taira no Tomomori and Igami no Gonta in the classic "Yoshitsune Senbon Zakura". March 1906: Tsubouchi Shôyô's drama "Hototogisu Kojô no Rakugetsu" is produced for the first time in Tôkyô, at the Tôkyôza; Tosshi plays the role of Ôno Shurinosuke [casting]. June 1906: Tosshi plays for the last time the role of Takechi Mitsuhide in the play "Ehon Taikôki", which is staged at the Meijiza. January 1914: Tosshi plays at the Tôkyôza the roles of Yuranosuke, Yajirobei and Shimizu Ikkaku in the classic "Kanadehon Chûshingura". May 1917: Tosshi plays at the Bentenza (Ôsaka) the role of the warrior Kumagai Jirô Naozane in the "Kumagai Jin'ya" scene of the classic "Ichi-no-Tani Futaba Gunki". October 1918: Tosshi plays at the Azumaza the role of the warrior Kumagai Jirô Naozane in the "Kumagai Jin'ya" scene of the classic "Ichi-no-Tani Futaba Gunki". January 1921: Tosshi plays at the Tatsumi Gekijô the role of the warrior Kumagai Jirô Naozane in the "Kumagai Jin'ya" scene of the classic "Ichi-no-Tani Futaba Gunki". December 1922: Tosshi plays at the Mikuniza the role of the warrior Kumagai Jirô Naozane in the "Kumagai Jin'ya" scene of the classic "Ichi-no-Tani Futaba Gunki". March 1924: Tosshi plays at the Kanda Gekijô the role of the warrior Kumagai Jirô Naozane in the "Kumagai Jin'ya" scene of the classic "Ichi-no-Tani Futaba Gunki". May 1924: Tosshi plays for the last time the role of the villain Motoemon in the drama "Tengajaya-mura", which is staged at the Azabu Meijiza (Tôkyô); his stage partners are Onoe Kikuemon (Iori), Nakamura Katsugorô (Genjirô) and Kawarasaki Gonjûrô II (Tôma Saburôemon). April 1925: Tosshi plays for the last time the roles of Sodehagi and Abe no Sadatô in the drama "Ôshû Adachi-ga-Hara", which is staged at the Tokiwaza. July 1925: Tosshi appears on stage for the last time, at the Kôen Gekijô, playing the role of Baba Saburô in the drama "Ôsakazuki Shusen no Tsuwamono". Sawamura Tosshi VII was a popular kaneru yakusha, who made a great career mainly on the Koshibai stages (Asakusaza, Azumaza, Engiza, Miyatoza). He excelled in the big tachimawari scenes, gaining the nickname of "ferocious actor" (môyû). 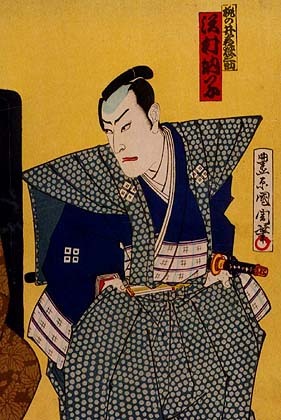 Sawamura Tosshi VII's best roles: Jirôzaemon ("Kagotsurube Sato no Eizame"), Marubashi Chûya ("Keian Taiheiki"), Terutora ("Shinshû Kawanakajima Kassen") and Sodehagi/Abe no Sadatô ("Ôshû Adachi-ga-Hara").